My status as a “Walking Injury” continues. I pulled some muscle in my back while working out and am trying to walk it off. Of course, muscle injuries are never in any hurry to heal. On the writing front, two things occurred. One good, one bad. The good news is we catalogued all the stories for the anthology and confirmed we have two thirds of all first drafts. The bad news is I gave up my writing time yesterday to watch the second-to-last episode of season 2 of Downton Abbey. Downton Abbey, for the uninformed, is a show about the life of the fictious Crawley family who happens to be the Earl of Grantham. The show begins in the precious few years before World War I, the results of which have drastically changed a lot of existing conceptions about what life should be like. The show’s attention to details, setting and sharp acting helped offset the lackluster plot design of earlier episodes: A few episodes seemed to revolve around a single plot that everyone in the household obsessed over. Early on, the writers seemed to have a fear of doing anything bad to their characters. However, the show’s developers seem to have caught onto this and began to shake things up like a snow globe. Characters start dying, others face life changing circumstances, and the lay-of-the-land is changing, but how is not yet clear. Continuing these plot twists will go far towards keeping the show fresh and interesting, a failing that put an end to The Killing. Viewers are often patient for the story to develop, but we can only be jerked around and put to bed so much. 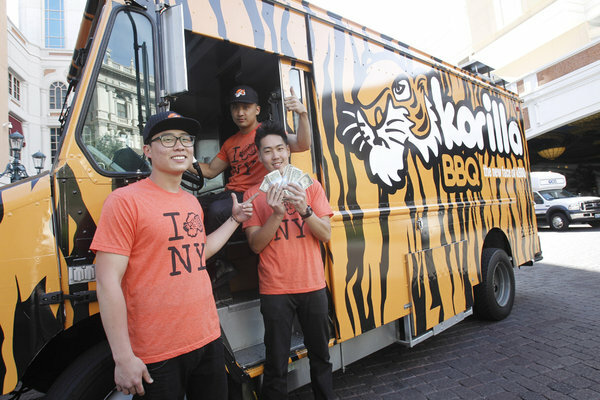 Last night, the Korilla BBQ team on The Great Food Truck Race was disqualified for cheating. In TGFTR, teams compete with their food trucks to sell the most goods and make the most profit possible. The lowest seller goes home that round until there’s only one left. But along the way the show’s host, Tyler Florence, hits all the teams with a wild speed bump. In the previous round, all the trucks were forced to sell their food for $1 or less. And in this round, they were forced to go vegetarian. The Seabirds, a full blown vegan truck, would have eaten this challenge up if they survived last round. But it was detrimental to two of the remaining four trucks, especially Korilla BBQ. It’s a shame. I was cheering for the Korillas for some time. They had less ego than some of the trucks (that’s not to say they had no ego). But they also proved to be both clever and resourceful, always tapping into the local Asian markets for the hook ups, finding out where to go and pulling something clever with the rules and challenges to give them an edge without going over the edge. But this time, they tried to be too clever. Over $2,000 extra was found in their cash box without receipts to match it. Tyler saw through this and called them out. The Korillas were my favored team, but cheating is cheating. I can’t defend that. The ironic thing was that Hodge Podge had fewer sales than Korillas did. If the Korillas had not attempted to cheat, they would have remained in the race. A food critic gave The Lime Truck immunity and Roxy’s Grilled Cheese finished first for sales. Personally, I’m cheering for Roxy’s now. I never disliked them and their likeable attitudes have grown on me. However, as much as I dislike The Lime Truck’s arrogance, the fact is that they seem to have the best looking (and probably tasting) food on the show and they usually pull bank. They react to the challenges and speed bumps well. I can’t even guess how all this will go down. Normally, I don’t watch much television. The shows I do watch include primarily AMC’s stuff, including Mad Men, The Killing and The Walking Dead. I’d like to get back into Breaking Bad and am waiting for the next season of Dexter and Fringe. The joy of all this is that despite these handful of shows, the various times they all come out limit me to no more than one, sometime two hours of television a week. But I love TGFTR for its business savvy on top of the cooking. Looking forward to next week.